Soon after Iranian officials announced they'd sent a monkey to space, close observers started wondering if the Iranians had been, as the saying goes, just monkeying around. "It looks like a very different monkey, the nose, the features, everything is different," Yariv Bash, founder and CEO of Space Israel, a non-profit Israeli space organization, told the U.K.'s Telegraph newspaper. "This means that either the original monkey died from a heart attack after the rocket landed or that the experiment didn't go that well." 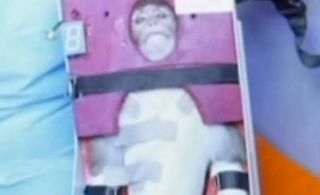 A live monkey was reportedly launched into space aboard an Iranian capsule called Pishgam, which means "pioneer." "I say this with certainty that the monkey is in good health and the space flight didn't have any physical effect on Pishgam," Ebrahimi said, referring to the monkey by its name, Pishgam, which means pioneer in Farsi. "Some of the photos released by one of news agencies were not related to the time of flight. They were archive photos of the monkeys being prepared for the launch." If the most recently monkey launch was in fact successful, it could pave the way for Iran to launch a human to space. The Islamic Republic's president Mahmoud Ahmadinejad has already volunteered to be the first to go.